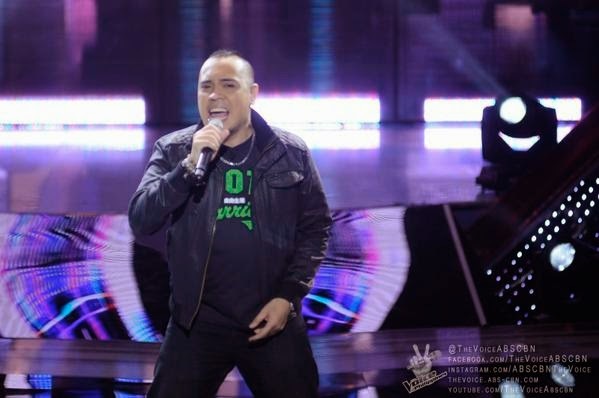 MANILA, Philippines - Mark Dagal of Quezon City performed Stevie Wonder hit "Superstition" during the continuation of Blind Auditions of the country's top-rating and Twitter-trending vocal competition 'The Voice of the Philippines Season 2 aired on Sunday, November 16, 2014. The 34-year old artist impressed Coach Sarah and Bamboo. Dagal picked Team Sarah. As of the November 16 episode, 29 artists have already convinced with at least one coach to turn around. So far, Team Apl has acquired Alisah Bonaobra, Mecerdital Quiachon, Samantha Felizco, Bradley Holmes, Jannet Cadayona, and Mark Cando, while Team Sarah has recruited Mark Dagal, Daniel Ombao, Demie Fresco, Jason Dy, Kokoi Baldo, Monique Lualhati, and Vanessa Monot. Coach Bamboo, meanwhile, has built a strong team with artists Lougee Basabas, Shaira Cervancia, Ramonne Rodriguez, Dang del Rosario, Kai Honasan, Karlo Mojica, Rence Rapanot, and Tanya Diaz, and coach Lea with Jem Cubil, Leah Patricio, Miro Valera, and Timothy Pavino. Which coach will the next four-chair turner pick? The Sunday's episode of 'The Voice of the Philippines' Season 2 dominates online conversations with '#BlindsPH' among the trending topics.